Imagine a boat—the kind of boat that wader-clad, ruddy-skinned men and women of the sea board before the sun comes up to bring in the big catch. With booms reaching both starboard and port, and lines dragging from strong rods and reels, answering to weather, currents, tides, and luck, the quest for the best of the sea is fought and won on most days. At the end of their shift these sturdy boats tuck in their buoys and booms and chug back to port, with captains calling in their catch and preparing the haul for delivery. 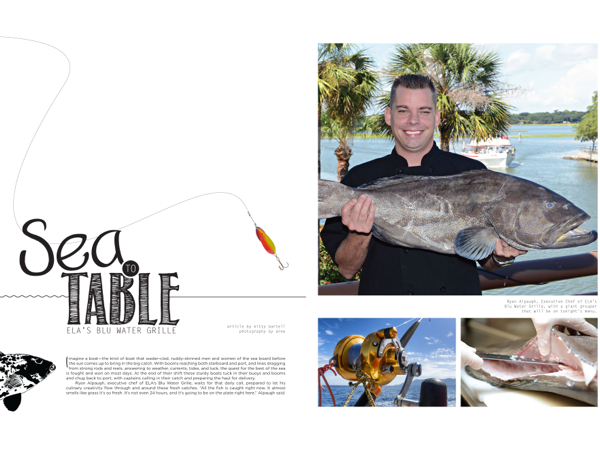 Ryan Alpaugh, executive chef of ELA’s Blu Water Grille, waits for that daily call, prepared to let his culinary creativity flow through and around these fresh catches. “All the fish is caught right now. It almost smells like grass it’s so fresh. It’s not even 24 hours, and it’s going to be on the plate right here,” Alpaugh said. From sourcing and having the expertise to cut down a massive side of tuna, all the way to selecting and preparing the most interesting varieties of oysters, ELA’s has earned the reputation as a seafood house to be reckoned with; that’s why they take sea-to-table so seriously. Owner Earl Nightingale has known Alpaugh for several years, but it has only been two months since bringing him onboard to lead their kitchen. “We actually had the interview two years ago,” Nightingale said. “He was our leading candidate.” The timing wasn’t quite right, but the two stayed in touch, and when the position recently became available, Alpaugh was ready. 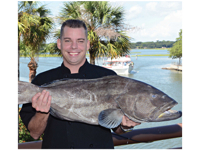 Ryan Alpaugh, Executive Chef of ELA’s Blu Water Grille, with a giant grouper that will be on tonight’s menu. Striking more than simply the seafood note, the ELA’s team seamlessly steps from sea to terra firma, offering steaks supplied by Meats by Linz, a 50-year-old Chicago family business, originally a neighborhood butcher shop. Their cattle are all from the upper plains of the Midwest and are fed a 100-percent vegetarian diet. ELA’s Blu Water Grille’s partnership with Linz, supplier to some of the finest restaurants in hotels, clubs, and casinos worldwide, helps satisfy Alpaugh’s most discerning meat eaters. “I like the ingredient to speak on its own,” he said—evident in his simply and perfectly seasoned thick cuts of meat. ELA’s is not only a fish house (with exceptionally great steaks); it is also a venue on the water with exceptional views of Shelter Cove Harbour from every seat, whether in the cozy bar, or on the wrap-around deck or the two floors of indoor dining with ambiance in spades. Perfectly appointed tables, bright original paintings, wood sailboats floating from the ceiling, and surfaces reflecting the water, the sun and, as evening progresses, the harbor lights and candles, create a modern, cozy place to enjoy an exceptional meal. It would be neglectful not to share some personal musings on a recent evening at ELA’s. The sunset was stellar, the harbor entertaining, and the ambiance simply perfect with live music spilling into the dining room. Enaldo, our charming waiter (the one with impeccable timing), helped us narrow our selections from the menu. Our palettes were well-amused, and a level of relaxation not reached in some time was achieved. Following refreshing cocktails, the highlights were two of Alpaugh’s specials that evening: a pecan-crusted crab cake over avocado chutney, with key lime aioli and ribbons of crispy prosciutto, and the snapper over stir-fry and blue crab sauce. Both dishes were inventive and seriously flavorful. The key lime pie was tart and rich, with freshly whipped sweet cream and a crumbly graham cracker crust that was just the right balance for the smooth, cool filling. So many delicious menu choices had to be set aside until next time, certainly leaving us in a state of anticipation. ELA’s Blu Water Grille is a special place to celebrate a special occasion or simply while away an evening over cocktails. Open for lunch, dinner, and a plated Sunday jazz brunch, the atmosphere features one of the best water views on Hilton Head Island and is just the tonic to ease into the coming week. 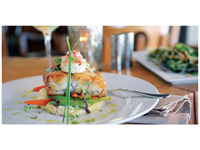 ELA’s Blu Water Grille is located on the water at One Shelter Cove Lane, Hilton Head Island. For more information or to make reservations please call (843) 785-3030, or visit elasgrille.com.